Andhra Pradesh Open Schooling Society is announced the 10th Class SSC Results 2016 today. Thousands of Students were appeared for the Open School SSC 10th Annual Examination during April/May 2016. All the students after appearing the examination now since one week, they are waiting for the Results announcement by APOSS. Today APOSS is published the AP Open School 10th Result 2016 and available at our website here to check online. 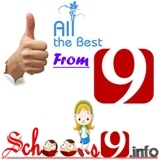 All the Students who are appeared for the above examination now they can check their AP Open School SSC Result 2016 from our website from here, using below provided link. Just Click on the below link and enter your Hall Ticket No and Get your detailed result. AP Open School 10th Subject wise Marks 2016 were available here. You can get APOSS 10th SSC Subject wise Marks 2016 using below link. School9 is wishing you the Best of Luck for your examination results. Quick check now your Examination Results.